Where you want to bike, walk or drive across the iconic Golden Gate Bridge, you will nee plan ahead to avoid traffic and fog. 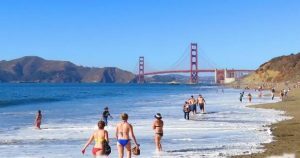 Did you know that San Francisco is colder and foggier in summer than in winter? Mark Twain says “my coldest winter was my summer in san Francisco”. Did you also know that the Golden Gate Bridge was the longest suspension bridge span in the world on completion in May 1937? Although, the bridge is not gold but it is famous for its ‘international orange’ color, which was chosen specifically because it complements the bridge’s natural surroundings and enhances its visibility in the fog. Be sure to check out Fort Point, Crissy Field and Spencer Battery overlook as well to capture the best views of the bridge. In 1870, William H. Hall, California’s first state engineer, assisted by John McLaren a Scottish landscape gardener, started laying out the Golden Gate Park project inspired by Frederick Law Olmsted, creator of the famous Central Park in New York. It was a considerable challenge for them to convert large sand dunes into a green park. The Park consists of 1,013 acres configured as a rectangle similar in shape to, but larger, than Central Park. With about 13 million visitors annually, Golden Gate Park is the third most visited city park in the United States after Central Park in New York City and Lincoln Park in Chicago. Some of the most popular attractions in Golden Gate Park include the Conservatory of Flowers, the De Young Museum, the Japanese Tea Garden, Queen Wilhelmina Garden and Dutch Windmill, Buffalo Paddock, the Rose Garden, California Academy of Sciences, the Arboretum, Golden Gate Archery Range, Stow Lake with its waterfalls, pagodas and boat house, the Polo Fields and the Beach Chalet Brewery and Restaurant. There are also many walking and biking trails as well, surrounded by ponds and manmade lakes and waterfalls along JFK Drive. 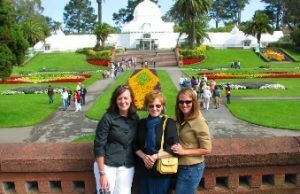 We recommend our San Francisco full-day private SUV tour to enjoy more time in Golden Gate Park, perhaps with a visit to the Japanese Tea Garden or to rent a boat on Stow Lake (entrance/rental fees are required at some attractions, and are not included in your tour price). This Japanese Tea Garden is the oldest public Japanese garden in the United States, which was built as part of a sprawling World’s Fair at the California Midwinter International Exposition of 1894. After the conclusion of the World’s Fair, Makoto Hagiwara, a Japanese immigrant and gardener, approached John McLaren with the idea to convert the temporary exhibit into a permanent park. Enjoy a peaceful walk through an amazing collection of trees and flowers, passing through green paths linked by wooden bridges over the water. You can also enjoy a Japanese herbal tea at the old teahouse. Completely rebuilt in 2008, the building covers 400,000 square feet (37,000 square meters) and is among the newest natural history museums in the United States. The primary building in Golden Gate Park reopened on September 27, 2008. Open a world of wonder with a single ticket. One general admission ticket grants access to a vast range of exhibits—including our aquarium, planetarium, and living roof—as well as a suite of daily programs and activities. Add in special tours, sleepovers, and after-hours events for endlessly exciting ways to explore the California Academy of Sciences. Hours of Operations: Open every day of the year. How Contact California Academy of Sciences? Save 42% on admission to the Academy and three other must-see San Francisco attractions with CityPASS—plus 3-days unlimited Cable Car rides & Muni bus Passport. 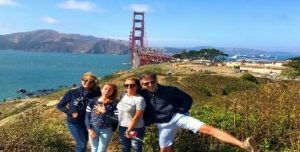 Read more about top things to do in San Francisco in Part 2.